As our busy days zoom by, we must not forget to nurture our most valuable resource: our children. In conjunction with the Kihei Youth Center and Sen. Roz Baker, the Hawai’i Medical Services Association (HMSA) presents the 2nd Annual South Maui Children and Youth Day event on Saturday, Oct. 18, from 3 to 8 p.m. at the Kenolio Park Recreation Complex in Kihei. The event will celebrate families, with a focus on preschool to middle school children. 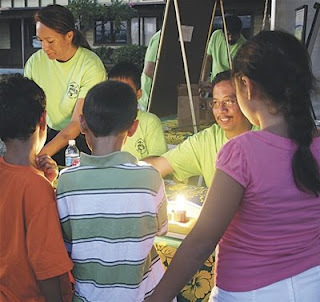 This month, a series of events across the state will be part of Hawai’s 2008 Children and Youth Month, celebrating 15 years of keiki appreciation. The South Maui Children and Youth Day will highlight events focused on education, with several hands-on activities to encourage parents to spend quality time with their precious keiki. The community is invited to enjoy this free, fun-filled family event which will feature free interactive, educational activities from over 20 nonprofit organizations. Tasty food will be available, and in compliance with the County of Maui vendor administrative rules, no craft items will be sold. The first 500 preschool to middle school kids who complete the Treasure Hunt game will be eligible to receive special goodie bags filled with items donated by event sponsors. Also, glow stick necklaces will be handed out, compliments of Resort Quest Hawaii: the management company of Kihei’s popular Maui Lu Hotel. Continued on Maui Weekly HERE.